Sunday Supplement rounds up the week's most important, amusing and link-worthy news stories. The mayoral campaign got another dose of craziness earlier this week when Rossi announced a plan to build a gazillion dollar tunnel along a similar path as the Spadina Expressway. Almost as bizzare as this idea, was the speed by which rumours of Pat Burns death spread across social media. "This intersection is where vision meets opportunity." - Rocco Rossi on his proposed "Toronto Tunnel" that would connect the Allen and Gardiner expressways. "I come to Quebec to spend some time with my family and they say I'm dead. I'm not dead, far f------ from it. They've had me dead since June." - Former Leafs coach, Pat Burns, on the false reports of his death. "Rob Ford will not apologize for trying to shine a spotlight on some very dark corners at City Hall." - A spokesperson for Rob Ford's campaign on Boardwalk Pub owner George Foulidis's threat that Ford apologize for making false statements or face a lawsuit. "We are concerned that with just six weeks until the election, no candidate has put forth a comprehensive plan on how they will unleash Toronto's capacity for economic growth and job creation," Carol Wilding, the Toronto Board of Trade's president and CEO, said in a statement. "Our economy is still dealing with economic uncertainty. We can't afford four more years of incremental movement on the key challenges." - The Board of Trade on our crop of leading mayoral candidates.
? - The cost of Rossi's Toronto Tunnel. 17th - U of T's spot in the latest Times Higher Education ranking. 8 - The number of station managers the TTC is introducing to downtown subway stops. 73 - The number of comments on our post about a TTC fare collector photographed playing online poker on the job. 8th - Toronto's rank in terms of the most expensive cities to live in the world. The lead map depicts Patrick Cain's speculation on what route(s) Rossi's tunnel might take. 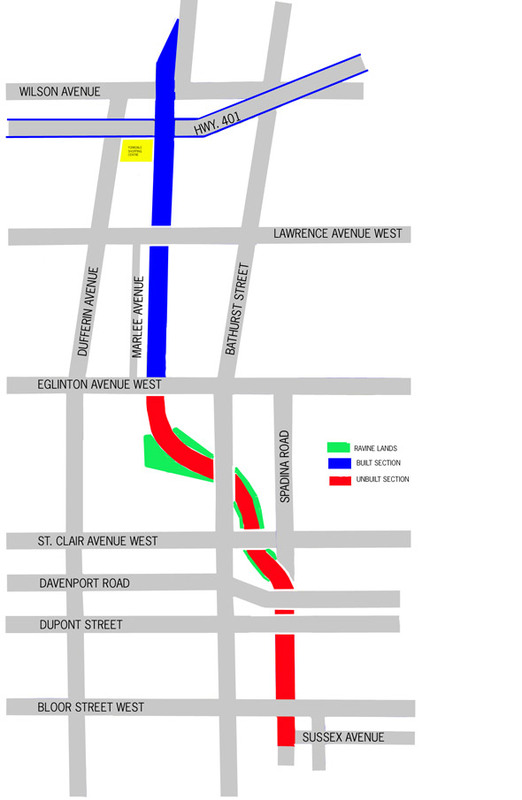 The map below shows the original plans for the Spadina Expressway.